Somebody found the blank retaining wall by my house irrisistable and painted a tag on it. I spent 45 minutes beginning the process of scraping it off. Probably painted on by a disgruntled school board member. When I’m not playing politics I’m playing in the snow. 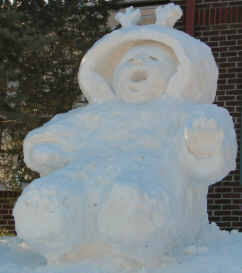 From this winter’s snow sculptures. Inspired by an April blizzard and my Grandson Tanner. For anyone who only saw my Pinocchio after coming back from spending January in Florida. Here’s my pics of this winter’s snow sculuptures at their freshest. After four years on his own our son is moving back for the summer. The nexus of his lease ending and making plans for next fall put him on a collision course with bumming with friends, moving home, or living on the streets. I’m glad to say his old room beckoned and he moved his stuff back during our gardening mania. It’s the temporary end to our empty nesting. I asked him to leave his bed alone until he moves back on the first of June. For the past week it’s been the place where I’ve been sorting documents relating to the Boyd Scandal. I’ve got to move it somewhere else but since my daughter’s bed is full of the stuff related to the Duluth Schools Endowment I’ve got nowhere to put the Scandal stuff. God forbid that I would put it in files. However tidy thatÂ would be it would threaten to put it out of my mind. Except for the bed my son’s room is packed with four years of stuff. I won’t be able to help my son move it out ofÂ his room until I clean up the attic today. I can’t get into the attic until I move the mattress and bed spring that he brought back away from the door to the attic. And the attic is so cluttered from a winter of haphazard storing that it has to be cleaned up first. Then there’s cleaning the garage and the basement workroom…. There’s just no end of chores standing in my way of getting this Boyd book written. At least the garden is finished and after last nights thunderstorms we should have four or five days of glorious weather. I just hope I’m not tempted to go agate hunting. I was out of town yesterday visiting family in the Twin Cities. They had nine fresh of snow on the ground. My niece, Lydia, helped me find a leprechan in her yard. It was St. Paddy’s day. Upon my return I found a call from the Trib’s reporter Scott Thistle. I’d missed his call but as soon as I picked up the Trib I knew what he wanted. It contained Scott’s story about a fellow who had built what he hoped was the tallest snow sculpture in Duluth’s history. Even though Scott no longer needed my background info I called to explain my not returning his call. Scott said he’d heard that I was mad at the Trib. I just laughed and told him I was over it. I also told him that you only get mad at the people you really love. Scott said he’d heard that before but he sounded skeptical.